You may think that Brussels Sprouts (or baby cabbages as they are known in our house) are a strange little vegetable to spend any time on, but they happen to be one of my favorites. I just like them because I think they taste good. Maybe I should like them because of all the great nutrition value they provide. Brussels Sprouts are an excellent source of both vitamin K and C.
Brussels sprouts are an excellent source of vitamin C, the body's primary water-soluble antioxidant. Vitamin C supports immune function and the manufacture of collagen, a protein that forms the ground substance of body structures including the skin, connective tissue, cartilage, and tendons. 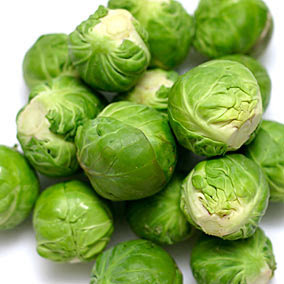 Add Brussels sprouts to your diet, and you'll increase your fiber intake. A cup of Brussels sprouts contains more than 4 grams of fiber, and both soluble and insoluble fiber are present in roughly equal amounts. Although I am fine with my Brussels Sprouts simply steamed. Here is a great sounding recipe you may want to try. I love Brussels sprouts! I usually dry roast them in the oven and add them to our dinner salad. Absolutely delicious! Baby cabbages, indeed! I can only get my 5 year old to eat brussel sprouts if I call them baby cabbages. We like them braised with balsamic vinegar...so good! We call them baby cabbages in my house too haha. Well when I was a kid that was. I remember my mum eating a whole plate of them for dinner one night, and I thought she was CRAZY. She must have known what you know. That they are good for ya!